'Paratha, one of the most difficult and time consuming recipe'- This was what I was assuming before trying out this easy recipe told by my Friend. Generally, parathas will have layers and kind of time consuming process. 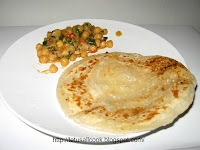 But,this recipe is very easy and even beginners can make wonderful and tasty parathas. Mix wheat flour ,2 tsp ghee, salt & Required water to make a dough consistency. Rub oil over & knead it soft . Let it rest for an hour. The more it rests, the more the parathas will be softer. Take a small amount of dough and roll it with the help of the roti roller. Apply some butter/ghee to it . Fold into two again fold the same.Start rolling to form a triangle or any shape you want. The main thing is, you need to roll and fold for at least 3 to 4 times. Heat a tawa or flat pan or griddle ,when it gets hot, add the paratha & let it cook for a minute. Now turn around & add a small tsp of ghee/oil around the paratha and cook for a minute. Now the paratha puffs up. Turn the other side and cook for 1/2 minute. When you are sure that both the sides are cooked serve hot with Channa Masala or any other side dish of your choice. looks easy to prepare.will try this..